Test according to EN ISO 22610Principle of operation is based on and in accordance with EN ISO 22610. Surgical drapes, gowns and clean air suits, used as medical devices, for patients, clinical staff and equipment - Test method to determine the resistance to wet bacterial penetration. Originally the Swedish standard HSS 8760019 was used as a basis for these measurements. Toothed wheel transmission, free of slippage, load compensated drive systemThe RULLA II test device is supplied with a fixed ratio toothed wheel transmission which works free of slippage and guarantees to reliably cover the complete test-surface during the preset time of 15 minutes. The load compensated drive system ensures a constant rotational speed of the agar plate holder of 60 ± 1 rpm over the entire range of 1 N to 3 N.
Programmable timerThe timer is preset by the factory to 15 minutes, i.e. the proper period necessary to perform the test according to the above standard. The digital timer is user-programmable to set other test-periods in the range from 1 second to 99 minutes and 59 seconds with an accuracy of ± 1 sec. The large LED display shows either the preset test period or while in operation shows the remaining run-time. 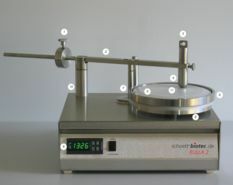 Housing, finger and turntable made of stainless steelAll essential parts of the housing are made of stainless steel, i.e. can readily be cleaned. The finger and the agar plate holder are made of stainless steel and can easily be removed for cleaning and disinfecting. Optional accessoriesOptionally available are the major accessories to perform the test. The support-cylinder is used during preparation for the test to stabilize the cover-/carrier-/reference material and assists in getting a smooth working surface of the materials inside the tenter frame. Not offered are additives to the agar and the strain of S. aureus. A dynamometer attachment point is located in-line with the center of the finger for a spring balance to adjust the downward force of the finger onto the test material. Both, the Swedish as well as the previous Schütt Labortechnik GmbH manufactured apparatus made use of the slippage between the drive belt and the driven wheel to ensure an even coverage of the test material's surface. Due to the increase in downward force of the finger from 1 N to 3 N (as stipulated by EN ISO 22610) the slippage in these earlier devices becomes very difficult to control and is likely to render less reproducible results.